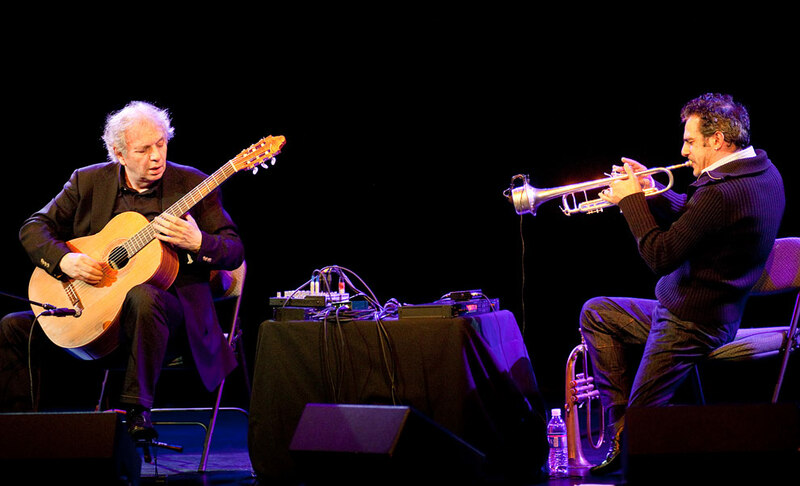 Ralph Towner and Paolo Fresu performing at the Triple Door Sunday night as the Earshot Jazz Spring Series continues. The duo of Towner and Fresu put on a beautiful concert. The sound of the classical guitar and the trumpet mingling together so fluidly was especially compelling. I will post some more pictures of the performance by these two in the coming week. Best known as the lead composer, guitarist, and keyboardist of the classic jazz ensemble Oregon, Ralph Towner has led a storied four decade career in improvised music. Towner’s blend of jazz, folk, and contemporary classical music offered a compelling alternative to the jazz-rock that ruled much of the 1970s (interestingly enough, however, Towner was also a valuable contributorto some vintage Weather Report line- ups). Towner’s first unaccompanied twelve-string guitar recordings were received as an entirely new musical idiom, and if one artist came to represent that classic ECM sound – spacious, rural, European or classical in design – it was Towner. His working relationship with ECM producer Manfred Eicher led to numerous fruitful collaborations, including recordings with Gary Peacock, Jack DeJohnette, Jan Garbarek, and Gary Burton. Towner is a true innovator, presenting ever fresh ideas while maintaining his rich, “pianistic” approach to guitar. As one critic has remarked, “his ability to work simultaneous lines, sustain rich harmonics and drones and even get a percussive counterpoint out of the snap of the strings and the thud of the sound-box is what makes his solo playing so rich and multi-dimensional.” A generation removed from Towner, Sardinian trumpeter Paolo Fresu is a premiere exponent of the new Italian jazz. Indebted to Enrico Rava, Kenny Wheeler, and mid-50s Miles Davis, Fresu creates a gorgeous sound on both trumpet and flugelhorn. Fresu has long admired Towner’s work for solo guitar, and paired together the duo creates sparse music of great melodic subtlety. Though they first met some fifteen years ago, Fresu and Towner recently released their first album as a duo, Chiaroscuro (ECM), a masterful exploration of the colors and opportunities afforded by the unique instrumental pairing. The duo’s live performances are augmented by some tasty electronics, and taken altogether Towner and Fresu create a music quite unlike any other. Wow, whoever that critic was hit the nail on the head. As a drummer, I love the percussive feel that Towner pulls off in his stuff.